Published in National Newswatch (August 29, 2017). 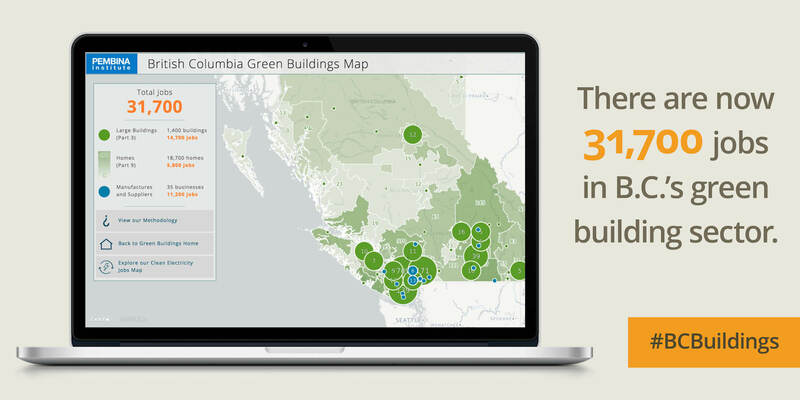 Explore the updated map to find out more about B.C.’s growing green building sector. Here in B.C., green buildings are quickly moving from niche to norm. All across the province, Passive House apartment buildings, LEED Platinum certified office space, and even green development plans for entire neighbourhoods are demonstrating the market demand for high-performance buildings. The green building industry is now estimated to employ 31,700 people in B.C. We’ve been tracking the growth in green building construction. First released in 2015, the Pembina Institute’s British Columbia Green Buildings Map has just been updated with all-new data for the past two years. The results show that the green building sector continues to be an important employer and source of economic activity in B.C. Let’s take a deeper look at the numbers. A number of larger green buildings have been completed in the past two years and several are currently under construction. These include commercial projects such as Metro Vancouver’s Annacis Research Centre in Delta and Vancity credit union’s Mount Tolmie community branch in Victoria, both certified to LEED Platinum. Ground-breaking projects include The Heights in Vancouver and the Dik Tiy Independent Living Facility in Smithers — multi-unit residential buildings that will be certified under the rigorous Passive House standard. There has been a 38% increase in investment in larger green buildings — up from an estimated $10.6 billion in 2014 to more than $14.5 billion in 2016. Job-wise, while there were around 7,000 people working on green building projects in 2014, there were 4,000 more (11,000) in 2016. The green home market has also grown over the past two years. We consider “green homes” to include houses that are certified by Natural Resources Canada as being better than B.C. Building Code, Energy Star, or R-2000, and those that meet Passive House, Living Building, LEED (Leadership in Energy and Environmental Design), or Built Green standards. This brings the total cumulative number of green homes we’ve been able to represent on the map from 18,200 to 18,700. The total number of jobs in green home construction remained steady at around 6,000. As the B.C. Energy Step Code launches, we expect the growth in green home and green building construction to accelerate even further in the next few years. 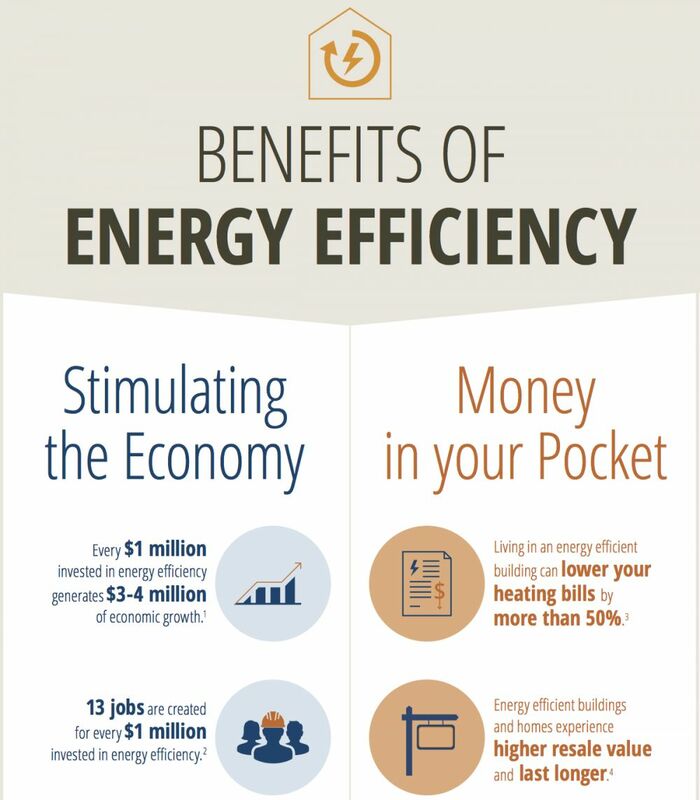 This is necessary if we are to meet our goal of having all new buildings be “net zero energy ready” by 2032. All of this is good news for green buildings and jobs in new construction. However, this growth in new construction comes alongside a decline in the retrofit market. Jobs related to energy-efficiency investments in existing buildings have decreased over the past two years. While we estimated the existence of 10,000 retrofit-related jobs in 2014, this figure has dropped to less than 7,000 in 2016 — a 33% decrease. This is partly due to the discontinuation of the LiveSmart B.C. program, which ran from 2008 to 2014 and offered homeowners rebates on energy-efficiency improvements. These services were transferred in 2014 to utility programs offered by B.C. Hydro and FortisBC. Since then, B.C. Hydro’s funding for residential demand-side management programs has decreased, and FortisBC’s overall residential spending has not significantly changed. Buildings that already exist today will make up half of the building stock in 2050. In order to reduce carbon pollution from the building sector and meet our climate targets, we must renew our investment in existing buildings and take a whole-building approach to energy-efficiency measures. These measures — which can include adding insulation, installing triple-pane windows, sealing air leaks, and replacing an old furnace — also help to cut utility bills and make homes and buildings perform better. Retrofitting a home or building can reduce mould and moisture, cut down on drafts and condensation, and improve health and comfort as a result. B.C.’s new government has an opportunity to renew efforts to improve the quality and performance of our existing housing stock. A comprehensive strategy is needed to set a course for the building sector to meet B.C.’s 2050 climate commitments. B.C. must see renewed government leadership on existing buildings in order to help this sector flourish. A robust plan will require a long-term strategy and commitment of resources, taking advantage of public funds to leverage private investment, and a sustained effort over the coming decades. There are now more than 20,000 green buildings in every corner of the province, with more popping up every week. These buildings are a major driver of B.C.’s clean economy, and they continue to pave the way for the future of the building industry. This future will see all new construction be net-zero energy ready by 2032, and will lead to healthier, more comfortable, and more affordable buildings becoming the norm in our communities. Dylan Heerema is an analyst with the Buildings and Urban Solutions Program at the Pembina Institute, Canada’s leading clean energy think-tank. He lives in Vancouver. This commentary originally appeared on National Newswatch on August 29, 2017. Tags: British Columbia, Provincial Policy, Energy Efficiency, Urban Planning, Buildings. Dylan is a member of the Pembina Institute’s remote communities team, working from the Vancouver office to advance policy supporting diesel reduction, energy efficiency and clean electrification.